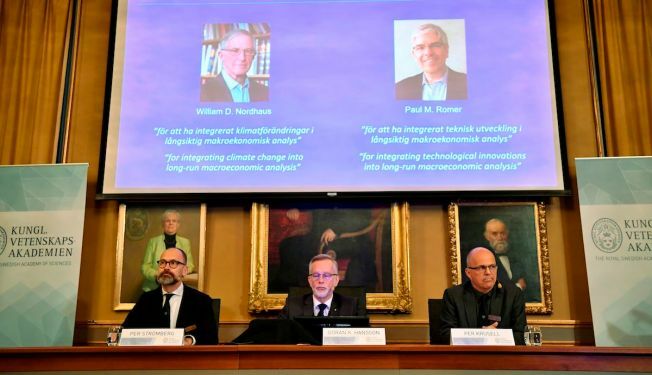 From left: Per Stroemberg, Goeran K Hansson and Per Krusell announce Americans William Nordhaus and Paul Romer as the laureates of the Nobel Prize in Economics during a press conference at The Royal Swedish Academy of Sciences in Stockholm on Monday, Oct. 8, 2018. William Nordhaus of Yale University and Paul Romer of New York University were announced winners of the 9-million-kronor ($1.01 million) prize on Monday by the Royal Swedish Academy of Sciences. The academy said Romer's work "explains how ideas are different to other goods and require specific conditions to thrive in a market." Previous macroeconomic research had emphasized technological innovation as a driver of growth but had not modelled how market conditions and economic decisions affected creation of new technologies, the academy said. Romer said Monday morning that he thought the calls from the Royal Academy were spam, so he didn't answer them at first. Nordhaus in the 1990s became the first person to create a model that "describes the global interplay between the economy and the climate," the academy said. He showed that "the most efficient remedy for problems caused by greenhouse gases is a global scheme of universally imposed carbon taxes." The prize comes just a day after an international panel of scientists issued a report detailing how Earth's weather, health and ecosystems would be in better shape if the world's leaders could somehow limit future human-caused warming to just 0.9 degrees Fahrenheit (a half degree Celsius) from now, instead of the globally agreed-upon goal of 1.8 degrees F (1 degree C). Nordhaus has argued that climate change should be considered a "global public good," like public health and international trade, and regulated accordingly, but not through a command-and-control approach. Instead, by agreeing on a global price for burning carbon that reflects its whole cost, this primary cause of rising temperatures could be traded and taxed, putting market forces to work on the problem. Many economists have since endorsed the concept of taxing carbon and using this financial lever to influence societal behavior. But adopting the regulatory frameworks on a global scale has been a complex challenge, and the world's political leaders are failing to meet it, the head of the United Nations said last month. The economics prize is the last of the Nobels to be announced this year. Last year's prize went to American Richard Thaler for studying how human irrationality affects economic theory.